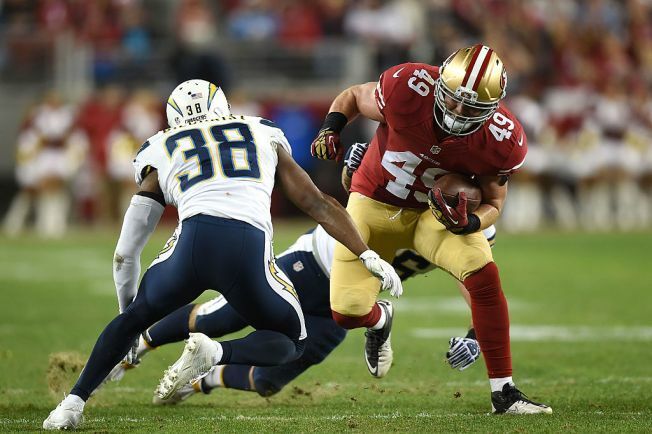 It was just a few years ago that Bruce Miller was a huge part of the 49ers’ success story. The former standout defensive lineman at Central Florida was converted into a fullback by head coach Jim Harbaugh and his staff, and he made an immediate impact. Miller was a ferocious blocker and excellent receiver. And, on special teams, he made jarring tackles and big plays. He pumped energy into his teammates with his intense play. Miller didn’t carry the ball much in the 49ers’ running game, but he was a key to the success the team had running the ball in the Harbaugh era. Often, it was Miller springing Frank Gore for big gains with a key block. From 2011 through 2015, Miller rarely missed a game. But as the 49ers prepare for their regular-season opener Monday night against the Los Angeles Rams, they’ll do so without Miller, who was released this week after being arrested on suspicion of being involved in an incident in which he is alleged to have attacked a 70-year-old man and his son at a hotel room. Chances are, however, that Miller may not have played a big role on this 2016 49ers team anyway. With the hiring of head coach Chip Kelly in the offseason, Miller’s fullback position essentially disappeared. Miller transitioned to tight end in offseason workouts and appeared ready to contribute. Kelly, in fact, said he considered Miller as simply “a football player” who could make an impact as a receiver, blocker and special teams presence. He liked his competitiveness and versatility. Yet in Kelly’s offense, Miller likely would have been only the No. 4 tight end, behind starter Vance McDonald and Garret Celek and Blake Bell. Michael Wagaman of ESPN.com projected before the start of training camp that Miller would stick with the team, but as a reserve, and that proved accurate. “Miller is making the transition from fullback and is a little undersized for the position, but the coaching staff loves his grit and ability to play on special teams,” Wagaman wrote. In the preseason, Miller had just three catches for 19 yards. Second-year tight end Bell – who enters the regular season as the third tight end option behind McDonald and Celek – had five catches for 43 yards. The 6-foot-6 Bell also showed late in 2015 that he could have a strong future, by making five starts and making 15 catches for 186 yards. All three tight ends are bigger, stronger and have shown more upside at the position than Miller. Though Miller was admired by his coaches and teammates for his toughness and attitude, his departure likely will have little impact on what the 49ers do or don’t accomplish in 2016.